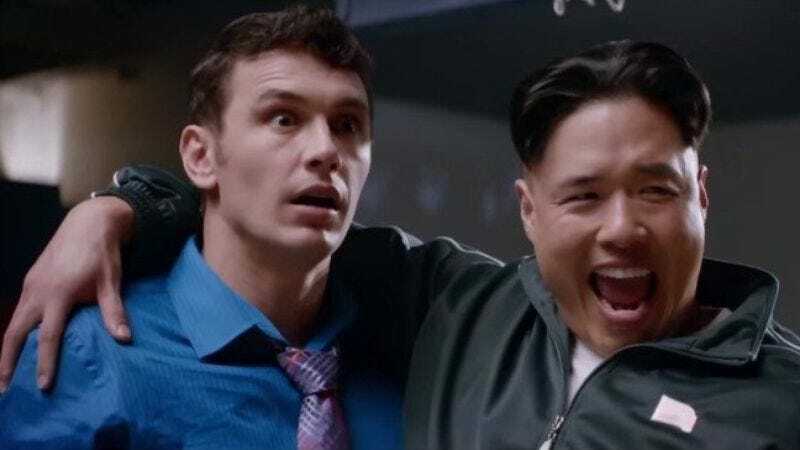 Soon we may be able to get back to our regularly scheduled programming of making fun of James Franco, because now that The Interview is dead and the FBI is taking over this North Korea-hacking-Sony thing, the Sony hacking may be over. According to Vulture, the so-called Guardians of Peace have sent a message to Sony executives promising to “ensure the security of your data unless you make additional trouble.” But they have conditions: one, that The Interview never be released anywhere in any form, and two, that everything related to the movie, including any versions that may end up on torrent sites and trailers like, oh, say, this one, be erased from the digital record. Peace talks are apparently also happening between Sony co-chairman Amy Pascal and the Rev. Al Sharpton, who reportedly met for about 90 minutes at a Manhattan hotel yesterday. After the meeting, Sharpton said “the jury is still out” on Pascal, and that he had told her that the hacky, racist jokes about President Obama’s taste in movies that she made in an email conversation with fellow executive Scott Rudin were the result of an “exclusionary, almost all white hierarchy” at Sony. Pascal and Sharpton apparently agreed to create a “working group” to deal with problems of racial diversity in the film industry. Sony’s apology to Adam Sandler is still forthcoming.